The Tray | Cannabis Rolling Tray | Dry Hollow Cache | Custom Tray Options | Marijuana Rolling Tray | Free Shipping | Create Your Own! Come see us and the Cache in person! Welcome to Dry Hollow Cache! We specialize in designing and building cannabis storage products for the connoisseur. Replace the standard stash box and put your marijuana accessories where they belong, inside a beautiful Cache! Browse what we have available or visit our website for the option to custom design your own. Enjoy! Sleek, stylish, beautiful. The function of the Cache is organized and has what you need, and looks great doing it. Fully personalized to hold what you want, how you want it! Add your own tools and your personalized art! The Tray rolling tray by Dry Hollow Cache! Simple design with personalization options and real wood! Custom art adds a personal touch to each Cache we make. It's designed for you, so make sure it looks the way you want! Video summary: Personalization makes everything more special. Laser engravings or hand-drawn wood burning and rock inlay. You decide what makes your Cache special! 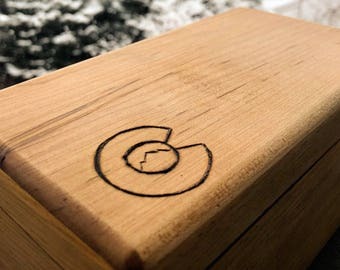 Reorganize your stash box with a personalized Cache by Dry Hollow Cache! Colorado marijuana laws have helped reshape how we look at and manage cannabis. The benefits of marijuana are being unlocked and there is no need to hide it any longer! I often see cluttered stash boxes or stinky drawers and decided to create a solution, the Cannabis Cache. No more glass on glass, flower being stored in plastic, or the elusive lighter! The marijuana connoisseur can now stay organized, while being functional and attractive. Hand crafted beauty from the center of the Rocky Mountains, Dry Hollow Cache Company was created to reimagine the way we approach cannabis inside every home.